Quantile-quantile bias-correction has been used in several northern hemisphere studies to improve the utility of regional climate model (RCM) outputs, however the technique is rarely used in Australia. The technique has the advantage of preserving complex changes in the RCM projections - e.g. to weather systems, dry spells, rainfall intensities, mean rainfalls, rainfall extremes - in hydrological modelling. The technique also has the advantage of retaining the physical correlation between rainfall and evapotranspiration. 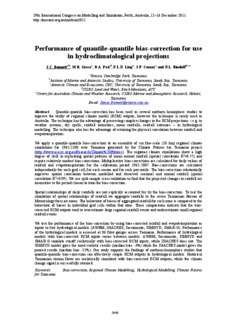 We apply a quantile-quantile bias-correction to an ensemble of six fine-scale (10 km) regional climate simulations for 1961-2100 over Tasmania generated by the Climate Futures for Tasmania project (http://www.acecrc.org.au/Research/ Climate%20Futures). The regional climate simulations show a high degree of skill in replicating spatial patterns of mean annual rainfall (spatial correlation R 2=0.75) and require relatively modest bias-corrections. Multiplicative bias-corrections are calculated for daily values of rainfall and evapotranspiration for the calibration period 1961-2007. Bias-corrections are calculated independently for each grid cell, for each season and for each percentile. The bias-correction substantially improves spatial correlation between modelled and observed seasonal and annual rainfall (spatial correlation R 20.99). We use split sample cross-validation to find that the projected changes to rainfall are insensitive to the period chosen to train the bias-correction. Spatial relationships of daily rainfalls are not explicitly accounted for by the bias-correction. To test the simulation of spatial relationships of rainfall we aggregate rainfalls to the seven Tasmanian Bureau of Meteorology forecast zones. The behaviour of biases of aggregated rainfall for each zone is compared to the behaviour of biases in individual grid cells within that zone. These comparisons indicate that the bias-corrected RCM outputs tend to overestimate large regional rainfall events and underestimate small regional rainfall events. We test the performance of the bias-correction by using bias-corrected rainfall and evapotranspiration as inputs to five hydrological models (AWBM, IHACRES, Sacramento, SIMHYD, SMAR-G). Performance of the hydrological models is assessed at 86 flow gauges across Tasmania. Performance of hydrological models with bias-corrected RCM inputs varies between models. AWBM, Sacramento, SIMHYD and SMAR-G simulate runoff realistically with bias-corrected RCM inputs, while IHACRES does not. The SIMHYD model gives the most realistic results (median bias -3%) while the IHACRES model gives the poorest results (median bias -21%). Our study supports the findings of northern-hemisphere studies that quantile-quantile bias-correction can effectively couple RCM outputs to hydrological models. Historical Tasmanian stream flows are realistically simulated with bias-corrected RCM outputs, while the climate change signal is successfully retained.